Roll has been off for several months during the Christmas season and then during inclement weather throughout the winter and early spring. His physique has maintained its core muscle strength and his good posture continues to be strong. 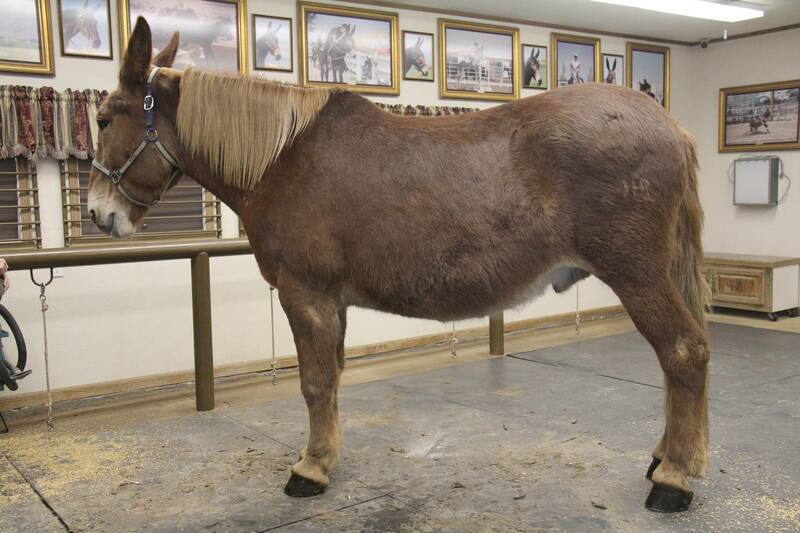 He has maintained this good posture and musculature over these five months on turnout alone. 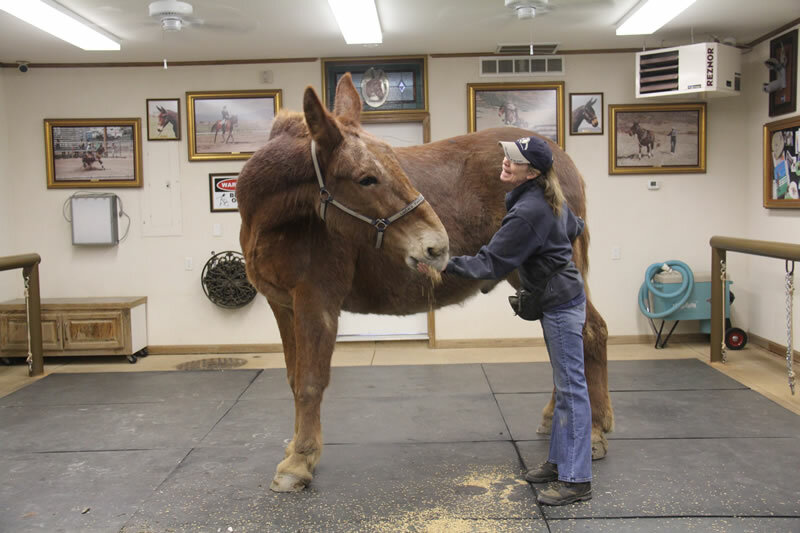 When an animal’s posture is truly changed and improved, he should reach a point where this becomes the norm and his way of standing and moving will reflect that. He no longer requires formal lessons to strengthen the muscles in good posture because he can now do it himself as long as he is given the room to move on a daily basis. 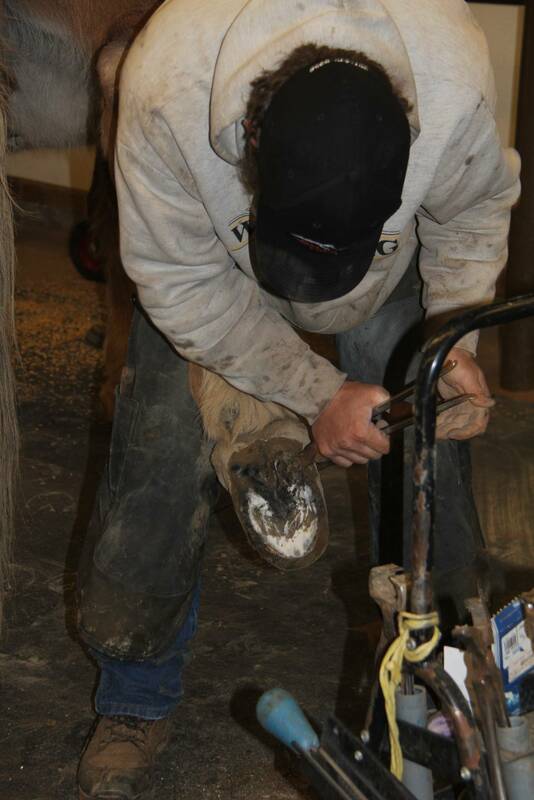 One of the most important things we did with Roll was to shoe his two hind feet. Back when he was first beginning the round pen work, I noticed he was twisting the rear feet, particularly on the right hind foot. 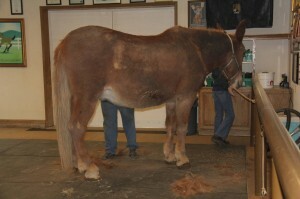 He began wearing his hooves unevenly which was compromising his ability to balance in good posture consistently. We theorized that if we could keep the foot flat when it hit the ground with no give, he would be able to track forward without twisting. This proved to be true and Roll has done well with frequent resets and new shoes at critical intervals. 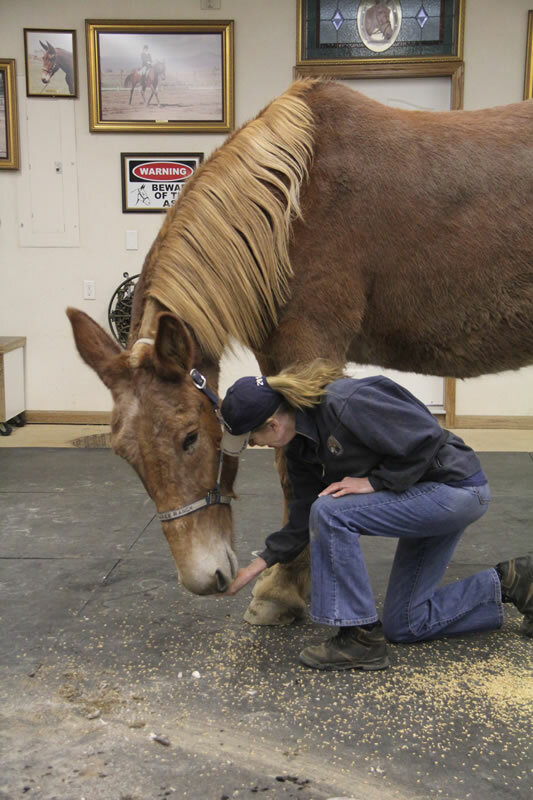 The founder he once had in his hooves is practically undetectable and his new-found health is exhilarating for him. 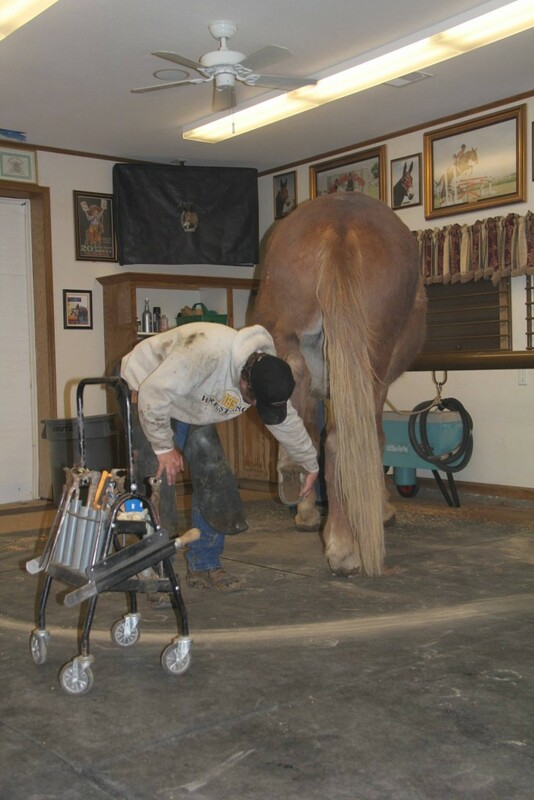 He welcomes the farrier visits as it makes him feels good. This would not have been possible without the right kinds of exercises and shoes. Roll stands stock still while he is being worked on and always seeks the four-square balanced position. 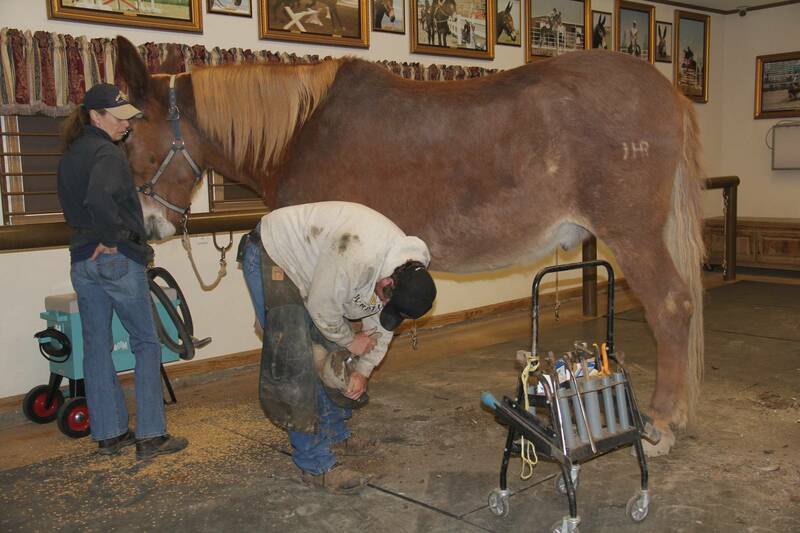 He doesn’t ever have to lean on the farrier because his good posture and balance is so strong. His feet are much improved and look fantastic compared to what we started with. …and then to stretch downward. All of these exercises allow him to learn to cope with a multitude of distractions and to handle them in a calm and thoughtful way, so that he learns to pay attention to all that is happening around him without becoming unduly nervous. 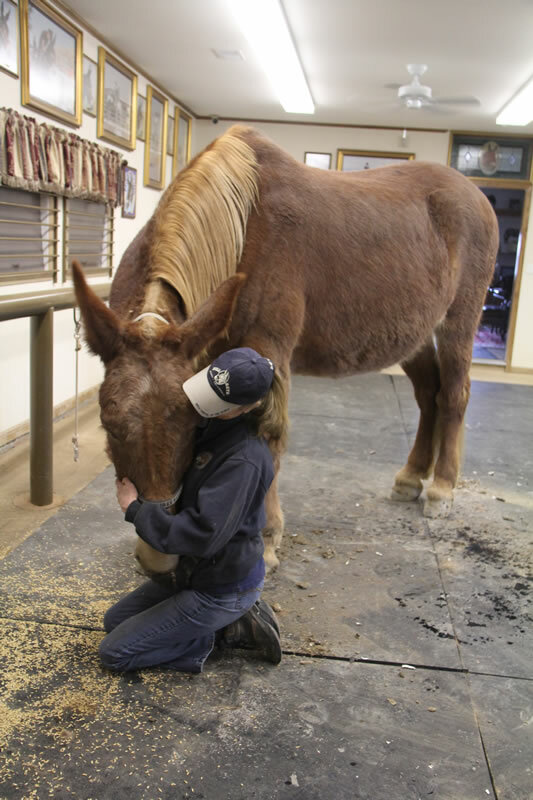 All this helps to make him a comfortable, happy, reliable and a safe equine to be around! He looks great! And very happy. What a lovely moment in the last photo! He clearly loves and trusts you.